In Indian Weddings, the color red holds a great importance. Since so many years the color red has been a constant companion of Indian brides. This color has been considered to be the symbol of life- a new life. The color red is an integral part of any Indian wedding in one way or the other; no matter which religion, caste or creed. Red color indicates the change a bride has to go through and as per the astrologers, the planet Mars also known as the Red Planet is known to be in-charge of marriages. According to Hindu religion, the color red also represents love, passion, prosperity and fertility. Indian Brides prefer this color is considered to be the most sacred color, and it also symbolizes wealth, strength, making it the perfect color to mark the start of a new life. 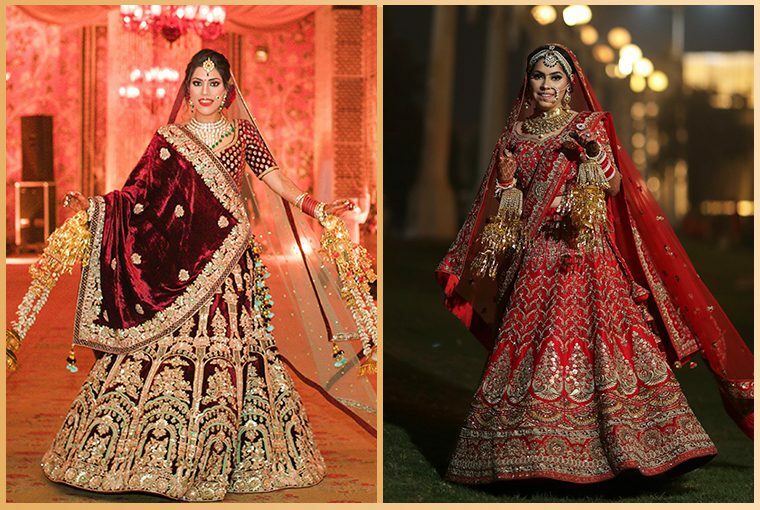 When it comes to choosing the wedding attire there are many options available that usually includes a ghagra-choli, a lehenga or a saree, but most brides prefer color red for their outfit. Red bridal attire with golden embroidery and gold jewelry donned by the bride makes her look the best for her most important day of life. The red colored outfit gives a vivid look; it ensures that the bride looks no less than a queen on her special day. There is also psychological reason behind the red color being the bride’s color as it is noted that it gives the bride much-needed strength that helps her to overcome the nervousness as well as anxiety, as she is stepping out of her comfort zone. What an integral part red color plays for Indian brides and their wedding attire!